***Since Waddell Vineyards is family owned and operated, please call before arrival if possible. Needing a breathtaking location for a monumental event in your life? Let Waddell Vineyards transform your vision into a reality. 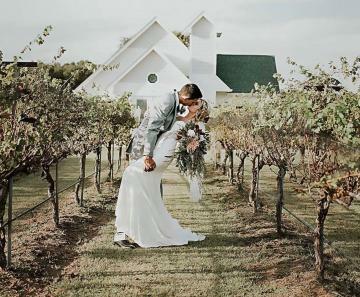 For weddings, events and more, we offer our beautiful wedding chapel, lush vineyard and scenic landscape to host the most significant occasion in your life. We'd love to talk to you about being your venue, so stop by to taste our wines and tour our wedding chapel. Waddell Vineyards makes a perfect venue for weddings, rehearsal dinners, family reunions, corporate events, birthday parties, anniversaries or any special occasion you want to celebrate. Our wedding chapel supports a large wrap around deck for dancing, music and eating. We will begin our next project of building a rustic event barn that will set about 300 yards behind the chapel. Looking for a fun event with your spouse, friends, family or group? Come enjoy your favorite wine and leave with a hand-painted masterpiece or new knowledge! Waddell Vineyards hosts a variety of events throughout the year. From our "Sip & Swirl" paint and sip classes to cooking demonstrations, discover a new way to unwind at the vineyard! We love what we do--wine! Our vineyard is home to the highest quality wines from the best Oklahoma grapes. Sample a variety of our delicious red, white and blended wines created on-site during our wine tasting events. With a unique selection available, we know you'll find a wine that you'll love.